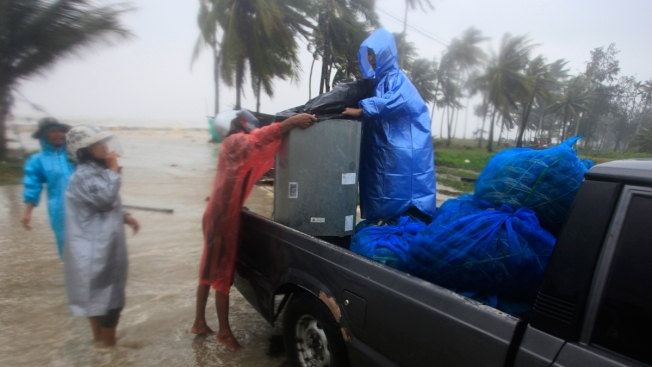 Locals clear out supplies from the coastline in preparation for the approaching Tropical Storm Pabuk, Friday, Jan. 4, 2019, in Pak Phanang, in the southern province of Nakhon Si Thammarat, southern Thailand. Rain, winds and surging seawater are striking southern Thailand as a strengthening tropical storm nears coastal villages and popular tourist resorts. "We can expect heavy rain and downpours, flooding and flash floods in the area throughout the night," he warned at a news conference. "Anyone still inside. Please make noise and officials will help you out. You cannot stay here. You cannot stay here. It's too dangerous," they said from truck-mounted loudspeakers. In Nakhon Si Thammarat's Pak Phanang district, where the storm later made landfall, a father and a son rushed off with their belongings on their pickup truck, quickly telling reporters the roof of their house was already damaged.